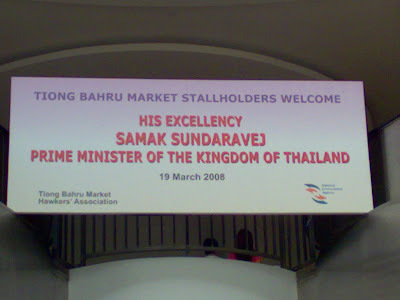 Early this morning, the current Thai prime minister, Mr Samak Sundaravej, dropped in for a visit. I wasn’t there when it happened. Anyway, this signage made it crystal clear why there were so much “touch-up” painting activities going on for the last whole week. And I thought it was some routine maintenance. So if you want to experience how Tiong Bahru Market was like when it 1st opened about a year and a half ago, today would be a good day. And when you visit the market, please take care of the place as we do not want to depend on such VIP visits to look fresh and clean. I was pleasantly surprised during my “early” morning stroll today. 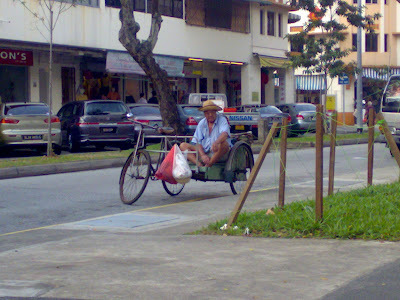 As I stepped off the escalators within the Tiong Bahru Market, happily sipping my coffee, I spotted this trishaw man resting in his “sar leng chia”. (It means a 3-wheeled vehicle in Hokkien). He is resting in the exact spot where many of his “KAKIS” (Buddies) used to hang out. In the distant past (in the 1970s), a dozen of them could be found here in the mornings and many uncles and aunties would use them to get around. Some of my classmates even travelled to school in them. I could still remember the trishaw man pedalling tirelessly through the “SI PAI POR” compound to get us to Neil Road. Now that I am much heavier, I don’t think this guy would be interested to help me ride down memory lane today. So I just took some pictures (secretly) and carried on with my stroll. 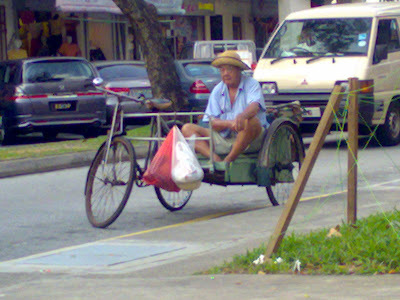 Doing some online research on Trishaws in Singapore (History of Trishaw), I found out that Trishaw became popular back then because petrol was not readily available. 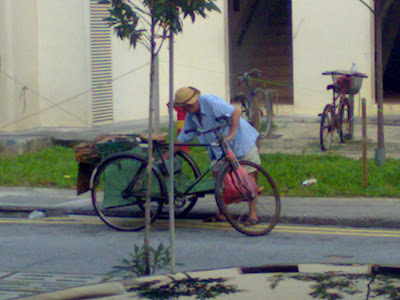 With the petrol prices hitting the roof, maybe, we will see more of these “uncles” around. Perhaps BAD CEMENT was the reason why this part of the work was stalled for 2 days…I kept thinking the weather was responsible. This stall is located ar #02-50 within the Tiong Bahru Food Centre. Mr Soh Chuan Siew runs the stall with his wife. 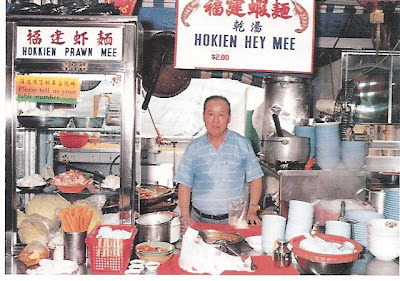 He’s the 3rd generation in his family to sell prawn noodles. When he came from China, his grandfather sold them from a pushcart here – for 30 cents per bowl! He taught his son who used to sell them at $1.20 a bowl in the eighties. Now Mr Soh sells the same great prawn noodles for $3 a bowl. But he also sells a smaller serving for $2 – and that’s what most people buy. 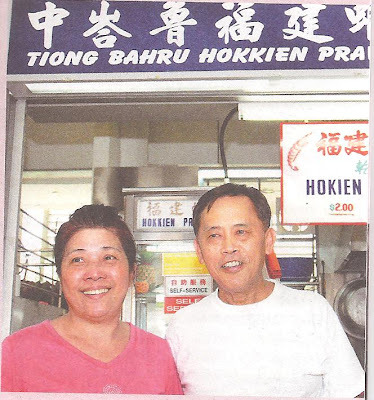 “We’ve had customers in Tiong Bahru since 1951. The noodles are perfect, the soup rich and tasty, and the prawns are so fresh you expect them to swim to the bottom of the bowl! Mr Soh Chuan Siew’s father, who operated the “HEY MEE” stall at the original Tiong Bahru Market in the 1980s. Guan Chuan Street within the Tiong Bahru Estate was named after So Guan Chuan. Guan Chuan was a merchant in the 19th century Singapore. 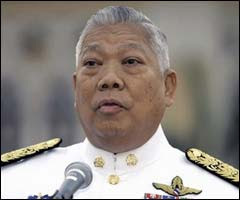 Little was known about him, other than the fact that he was elected a member of the Singapore Chamber of Commerce in 1837. The chamber then had only a few Chinese merchants as members. He was also a founder member of the Qing De Hui and he contributed generously to the building funds for the construction of the Tian Fu Gong in Telok Ayer Street. 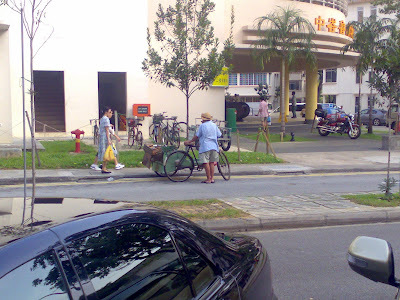 You are currently browsing the Tiong Bahru Estate blog archives for March, 2008.